On Wednesday September 26th 2018, I went to the CareerFair not knowing what to expect. Was there going to be lines? Am I going to be able to go to all of the booths? 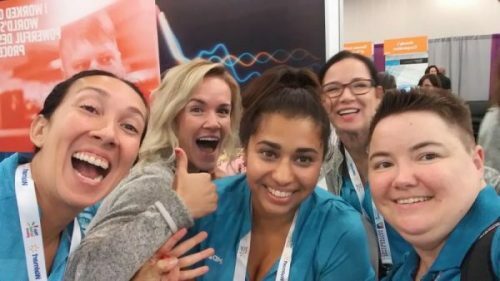 What are all the companies that are represented at GHC18? Which company booth will I get a group selfie at? I bet you are wondering the answer to those questions. Once I heard that there are over 20,000 attendees for the Grace Hopper Celebration was when I knew I had the answer to my first question. Yes there was lines and they were long lines. At least long enough to wait about 30 minutes in. I have yet to wait that long with one of those companies. With probably over 50 companies there and only being on one side of the room, I was unable to go to all the booths. That is okay though as I have today and tomorrow still. It is a overwhelming career fair and there are probably at least 100 companies if not more here in Houston being represented at the GHC18. To name a few: Express Scripts, AMD, Indeed, Facebook, Amazon, and Intel. And of course the final questions of who I took a selfie with. With all the excitement and very few recruiters at the one booth, I had waited what seemed like 30 minutes but I know it was not to talk with a University Recruiter is the booth I decided to do a selfie with. AMD is an amazing group and I learned that they have a new product that recently came out. I am hoping to be able to connect after the conference and possibly get a Co-op with them because they cannot really do Summer Internships. In the picture is Aarti Pandey, Neveresa Mustafic Nevy, Delphine Hamant, and Sarah Feller from AMD.